We are proud to bring to you our new fresh Perfect Spring bouquet. 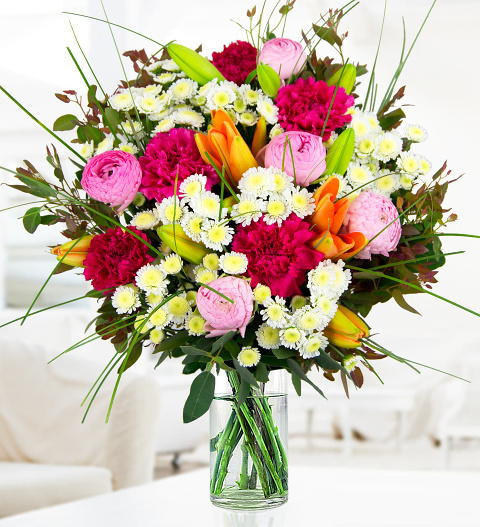 Bursting with vibrant joyful colours, this is a bouquet designed for impact. Each one is expertly hand tied by only our best florists with Spring ranunculus, cerise carnations, stallion chrysanthemums with delightful Lily La Orange lilies. The bouquet is artistically finished with eucalyptus and bear grass to complete this special arrangement. A gorgeous bouquet perfect for your lucky recipient. Chocolates may contain nuts.